When Christie’s released the news that the star bottle for its Geneva wine sale on May 15th was a bottle of 1774 ‘Vin Jaune’ from the Vercel collection, it raised a few eyebrows from those who know Jura wines well, not least from those living in Arbois, and from me for that matter. The sale estimate of CHF40-50,000 may sound a lot, but at current exchange rates the upper estimate is about 25% lower than that achieved at the auction of one of its ‘sister bottles’ that took place in Arbois in February 2011. The two big questions are firstly who exactly has offered this bottle for sale, and secondly, who is going to pay all that money for it? The buyer of the bottle sold at the auction at the Percée du Vin Jaune last year, Swiss wine collector and broker Pierre Chevrier has not suddenly decided to sell his bottle, and told me a couple of days ago that he is tired of the phone calls he has been receiving about it – he is still planning the dinner at which it will be a centrepiece in a couple of years’ time. When researching my recent article in World of Fine Wine I was told there were probably 15 – 20 further bottles from the same lot and same vintage, but that they had been split between the three remaining descendents of the Vercel family, and were not all in good condition (showing good clarity and levels in the bottle). Yesterday, the local Jura television station, France 3 Franche-Comté, ran a short news piece – styled almost as a mystery ‘whodunnit’ – on the question of where the bottle being offered at Christie’s came from, claiming at the end of the broadcast that they now knew for sure that the bottle was being sold by someone in Arbois, but that the person’s identity was, not surprisingly, being kept a secret. Christie’s are erroneously calling the bottle, that has no label, a ‘Vin Jaune’. Back in the 18th century that term was not used, in fact it was quite derogatory. Wine to age was named ‘vin de garde’. It is, however, true that today the 1774 Arbois wine is deemed to be a Vin Jaune, since laboratory analyses and tasting of two of its sister bottles in the early 1990s confirmed that it showed all the attributes and characteristics of a Vin Jaune, a drinkable one at that! So, who will buy the bottle and for how much? Alice Feiring, a devout fan of the Jura, has expressed concern that the Christie’s sale would raise the profile of the region to an extent that might make it a target for counterfeiting, something the region has successfully avoided so far. The France 3 video emphasizes that there has been no question of falsity in the bottles of 1774 offered to the market at Arbois last year, or at Christie’s this year. However, the future is less certain. Alice wonders whether, apart from Paris-based wine collector François Audouze, the under-bidder in last year’s auction, there will be that much demand for the bottle at its estimated price, without the excitement that is built each year with the Percée du Vin Jaune festival. Bernard Pujol, who runs the auction of old bottles at the Percée agrees with her, and stated on the France 3 interview that he would not have advised selling right now [so soon after the previous sale] and that he fears the price may be lower than that achieved at Arbois, which is not good for the market. However, over on the French wine forum of La Passion du Vin, Audouze freely expresses that having bid much too high on the first bottle last year – and lost – the estimate on the Christie’s bottle is high because of that bidding war, and he fears that the publicity created by Christie’s will attract numerous Chinese to push the price up once again, so he may not win this one either. The problem of the rich, as he rightly points out. Personally, I think that all of this publicity is great news for the Jura region, and especially for Vin Jaune. In the ten years that I’ve been following the Jura and Vin Jaune, prices direct from the producer hardly shifted until the last couple of years, indeed there has been an outcry about price cutting of Vin Jaune from larger producers sold in the supermarkets at certain times of the year for as low as €15. 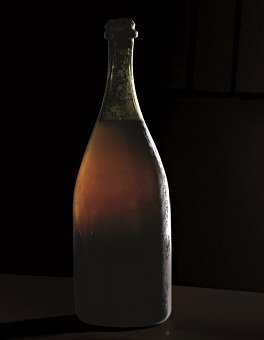 For such a fine, ageworthy wine produced in such small quantities – on average a mere 400,000 bottles a year – a price direct from the producer of €25-€30 per clavelin (the special 62cl bottle) could hardly be called greedy when compared to many wines with far shorter life expectancy from Bordeaux or Burgundy.